The semi-pendant, double orange-red flowers carry numerous brown to black spots. Producing many black-brown axial bulbils, they are fully ripe and have already begun producing roots before dropping to the ground in the late fall. Easily grown, they rarely need to be lifted and divided. It is not recommended to grown and of the Lilium lancifolium/tigrinum if you are growing any other species as aphids will pass along numerous virus infections from them to your other plants. As with the single flower form, this is a �Typhoid Mary� in the garden. Susceptible also are all other plants growing from a bulb or tuberous root along with your roses. 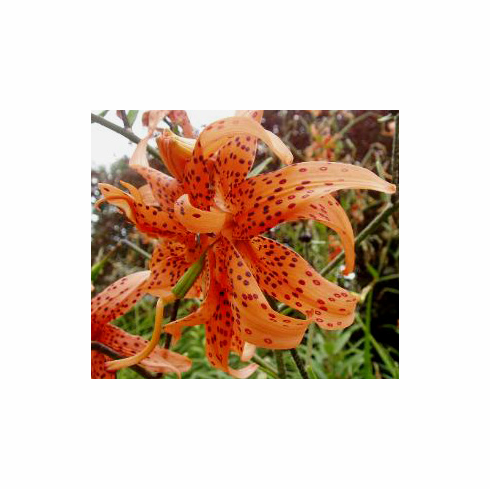 We have never offered this lily species because of the damage it has the potential to inflict on your other garden subjects. Photo courtesy of our good friend Riz Reyes. Copyright Riz Reyes, all rights reserved. Used with permission.